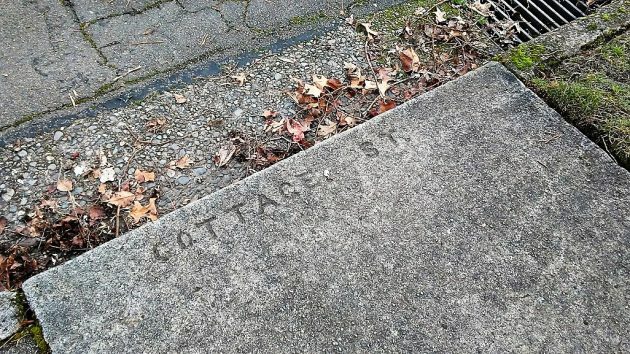 Meandering around West Albany on foot, you might come across “Cottage Street.” It says so on the concrete curb. But the street sign says Takena. What’s the story here? I wish I knew. But all I can do is surmise, based on taking a look at city directories available — some of them — at the Albany Regional Museum and online at cityofalbany.net. So, it appears that either in 1949 or ’50, people in city hall or at the post office thought it was too confusing to have the northern five blocks of that street called Cottage and the southern end named something else. So they renamed the part that used to be Cottage. If anybody reading this was around nearly 70 years ago and has another explanation, I’d like to hear it. This isn’t the only oddity with street names that pops up when you cast your gaze earthward while hoofing it around that part of town. 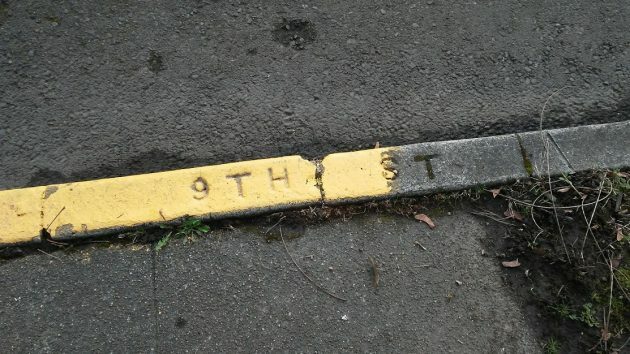 You will notice, for example, that the numbered streets, such as Ninth in this photo, were called streets when the sidewalks were built and the concrete poured for the curbs. Now Albany’s east-west streets are almost uniformly called avenues. Why the change, and when did it come about? Four or five decades ago, the local paper led a campaign to make “Calapooia” the proper spelling of that Indian name, eventually causing the school district to agree to exchange the “y” in Calapooya to an “i” when the junior high by that name became a middle school. 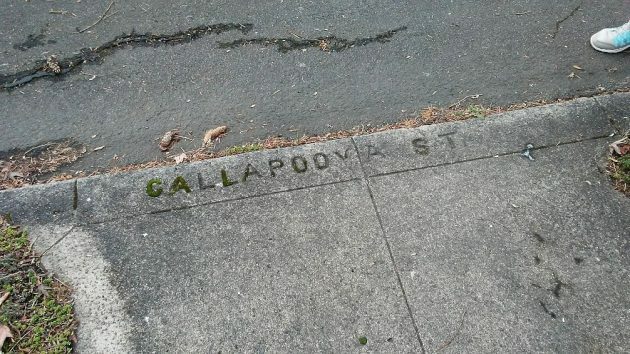 So what’s with that “Callapooya” in the concrete curb? A “y” and two “l’s”? Maybe that’s a useful reminder that the indigenous people in this valley didn’t care how English-speakers a century later would write their name. I just wanted to say that I’ve always enjoyed your writing. Thanks! Far be it from me to correct something in your post today, but the Calapooia/.Calapooya school name was changed when an arsonist set the school on fire and burned up most of the front. (it was 1975 or so). After years of badgering by Wally Eakin on the spelling of the name of the school, the district Assistant Superintendent (me), recommended to the DH that if they wanted the spelling to change, they should come up with the $$ to cover the cost. And they did! At the risk of starting a memory duel, the “y” was still in the name when I came to work at the DH in 1977. I vaguely remember when the change was made, so I doubt it happened before I was around. Please explain what is offensive. I’ve wondered, and asked at the museum, how Queen Ave. got it’s name. No one seemed to know. Seems like a story there! Interesting and fun to ponder article. Thank you. Thanks a lot for that information, coming as it does from somebody who knows. Any chance of pinpointing the date the ordinance passed? I know that it was Ordinance # 1969. I have a copy of it in my desk at work. It has the date on it. I am certain it was either sometime in 1949 or 1950. I will be able to let you know on Monday when I get back to work. I was passing by the office, so I stopped in to check. Ordinance 1949, which made those street name changes, was adopted on March 23, 1949. I don’t remember when they changed Avenue and Streets. When I was on the council we had a long meeting lasting until midnight. The postmaster sat through the whole meeting because the last item was where we wanted the direction either north, south etc after the street number, before street name, or after number and street name. We chose after so to be correct an address should read 123 Broadalbin SE. People put it wherever they want, it seems today, but that also may have been when SE was added instead of just South. Thankfully renaming in Oregon kept descriptive names instead of choosing a sterile grid coordinate ( as a grainbelt county did). I lived in the Albany downtown historic Montieth district for over 25 years…ON Calapooia street. I used to ponder why the sidewalk corners had different spellings on each corner. I learmed about the Callapooya Indian tribe who inhabited the region and downtown area. I only wish there was more information and history…i think it would be fascinating and wonderful to know more about the people who lived there before me. I was looking at a deed from 1908 and found spelling of Calapooia spelled as I just wrote it, so it was spelled this way for a long time. I am certain you know that the Kalapuya peoples were here for a very long time, before the white settlers adopted “their way” of spelling Calapooia.